Professional speaker, Lindsey Foster is faced with losing her only child, Greta, when Greta is diagnosed with cancer. Desperate to be closer to her during this crisis, Lindsey heads to Simon’s Point, Wisconsin, where Greta lives. Although Lindsey finds her greatest joy from inspiring her audiences with the healing power of women’s stories, her heart aches over her inability to heal her emotionally distant relationship with her daughter. Divorced from Greta’s blustery dad, Brian, Lindsey is drawn to him now as they share their fears about Greta. She never expects to experience the drama of becoming involved with her ex-husband or to confront the dilemma of another man falling for her, especially Sam, her son-in-law’s widowed father. But Sam, quiet and reflective, offers more than friendship and becomes her refuge in this time of crisis. With her willingness to do anything to make her daughter happy, Lindsey makes questionable decisions and keeps secrets from Greta, causing more heartbreak. Feeling exiled once again, Lindsey faces choices that will define her future—and her relationship with her daughter. But will Lindsey ever receive Greta’s Grace? I’d wasted too much time longing for what I didn’t have,and waiting for the tiniest indication that it might be on its way. For years, I’d listened to other women tell amusing mother-daughter stories about shopping adventures or wedding glitches or the challenge of finding a free day to meet for lunch. I struggled to keep my heart free of envy, but I admit that too often I grudgingly laughed at these glimpses into other women’s lives. They already had what I wanted for Greta and me. For years, I nurtured my wish and kept it alive in my heart. Then, in an instant, it no longer mattered. All I wanted was for Greta to get well. She didn’t look sick when I saw her shortly after her diagnosis, leading me to the ridiculous thought that perhaps someone had made a horrible mistake. I’d hurried to the conference room on the oncology floor at the Bayside Medical Center, but stopped to peer through the half-open door and breathe deeply to collect myself before stepping inside. Greta had tossed aside her boots and sat cross-legged in the middle of a short couch, her elbows resting on her knees. Using her fingers like a pair of scissors, she captured flyaway strands of her long blond hair and tucked them behind her ears. When she looked up and saw me standing in the doorway, I rushed to hug her. “Mom, you got here.” Greta’s slender arms stretched up and loosely circled my neck. “I never saw this coming,” she whispered. “Oh, sweetheart, I don’t think we ever see this kind of thing on the horizon.” Her cheek felt smooth against my own. And did I imagine it, or were the bones in her shoulders more prominent than ever? My daughter couldn’t spare even a single pound on her willowy frame. When she dropped her arms, I sat in the chair next to the couch and nodded to the older woman across from me. I hadn’t expected to see Greta’s grandmother-in-law, Ida, sitting there with shoulders squared and ankles crossed, stubby fingers wrapped around the strap of the purse she held firmly in her lap. Ida didn’t reply, but she slid back in the chair. I’d met Ida only twice, the second time at Greta and Jake’s wedding. They’d had their reception in Simon’s Point at the Iverson Café and Bakery, a business Ida had owned for decades and turned into a Wisconsin landmark, thanks to her Swedish pancakes and cinnamon rolls. Theoretically, Ida’s pink cheeks and cap of tight gray curls should have made her look like a cheerful and grandmotherly baker, but I found her stiff posture and frown disapproving, even intimidating. “Where’s Jake?” I asked out of curiosity, but also to fill the uneasy silence of waiting to learn what was in store for Greta. “He’s hunting up lunch. I didn’t eat this morning and that drives him nuts, especially now.” Her silky hair again refused to behave and she busied her hands trying to make the wispy strands stay put. I glanced at Ida and defensively explained that even as a small child, Greta had often forgotten to eat. Ida’s gruff tone grated on my nerves, but Greta’s ex- pression reflected only fondness and good-natured acceptance of the older woman’s quirks. I understood why. Sadly, Greta was destined to spend many hours at the Bayside Medical Center, an older square brick building set back from the Fox River in Green Bay, Wisconsin. The half-open door was a compromise between preserving privacy and encouraging more air into the hot, stuffy room. Everything had a dull cast, from the matte gray walls to the blue-gray carpet and the matching tweed fabric on the couch and chairs. We already knew that a stubborn flu hadn’t caused Greta’s on-and-off fevers, or the malaise that dragged on through January and into February. Jake had first noticed the swelling above Greta’s collar- bone and from that moment on, worry and waiting took over and consumed every hour of every day. Greta was my only child, my heart. I wasn’t ready to contemplate losing her. At first, any news about Greta and her symptoms fell into simple categories, bad and good. When the biopsy led to a diagnosis of Hodgkin’s disease, the categories were shaken up, leaving us suspended in despair, while at the same time holding on to reasons for optimism. That explained the dizzying euphoria that rushed through my body when I heard the magic words, Stage I! Although she had symptoms, the disease itself was confined to one side of her upper body. Only caught up in the terrifying world of cancer could we find ourselves overwhelmed with gratitude that Greta’s case fell into the least bad of the bad. I’d driven northeast to Green Bay from a hospital in Madison, where, ironically, I’d delivered the keynote at a two-day conference for several hundred cancer patients and survivors, most of whom were women. Many nurses and a few doctors who’d fought the good fight themselves also attended. I presented my usual topic, the healing power of women’s stories. True, professional speaking isn’t exactly show business, but we do live by the ethic that the show must go on. Over the previous days, I’d given my talks, and then immediately rushed off to find a quiet place to check my texts and voice mail. I lived with the paradox of de- sperately wanting to hear some news while dreading the message itself. As soon as my last workshop ended, I drove away, ready to give Greta all my support. “She’s where?” Ida leaned forward and tapped her index finger against one ear as if checking her hearing aid. “My mother is what one would call active.” I hoped my tone came across as dry but amusing. Our light interlude ended when Brian, my ex-husband, appeared at the door. Two long strides later he had Greta in his arms. “Daddy, oh Daddy.” She wrapped her arms around him and dug her fingers into the back of his sweater, desperately grabbing at the fabric and hanging on tight. She scooted over to make room for him to sit next to her, and then rested her head on his shoulder. With one arm draped around her, Brian rested his chin on the top of her head. “I’m sure she isn’t going far, honey.” Brian raised his free hand in a half wave that could have meant either hello or goodbye, or in that moment, both. “Jake should be right along,” Ida said, narrowing her eyes at Brian as she gave Greta’s hand a quick squeeze before she left. Brian gently rubbed Greta’s shoulder as she talked about the alphabet soup of tests, the CAT and PET scans and the vials of her blood drawn and carried off. I was certain that like me, Brian had heard much of this before, but he let her tell the stories over again without interrupting. I had talked briefly with Brian a few times over the previous days, but I hadn’t seen him since Greta’s wedding, not that he’d changed much over the last year. His thick hair had once been the sunny color of Greta’s, but before he’d turned forty, it had turned snowy white. That feature alone triggered quick double-takes from women young and old. Greta inherited her height and angular stature from Brian, along with his light blue eyes, clear and bright as marbles. Their resemblance was nothing less than startling. I provided the contrast. Short and curvy best described me, not a straight line anywhere. Brian had once said my hair and eyes reminded him of bittersweet chocolate, mouth- watering bittersweet chocolate to be exact, but he’d said those words long ago. Only the most scrutinizing eyes could see that the slope of Greta’s long nose was identical to mine, but then her nose had never been her favorite feature. “Thanks for the info, Lindsey, but that tells me exactly nothing.” He emphasized his dismissal with a flick of his hand. “Well hello to you, too,” I said, glad I could manage weak sarcasm in response to his rude gesture. It was so like him to raise questions about a doctor he hadn’t handpicked and doubt anyone else’s ability to find the so-called best. Brian looked sheepish and started to respond, but the door swung wide open and the aromas of garlic and starchy steamed rice filled the room. Brian stayed put, oblivious to the commanding presence of his tall, broad-shouldered son-in-law planted in front of him. Since the dad showed no sign of giving up his place to the husband, I stood and touched Jake lightly on the shoulder. “We’ll leave the two of you alone.” I cast a pointed look at Brian, cocking my head toward the door. He followed me out only when Greta shifted her body— and her attention—away from him and toward Jake. Brian glanced toward the glass partition that looked into the large waiting room. Ida sat in one of the overstuffed chairs in the room, while Jake’s father, Sam, leaned against the wall next to her. “You won’t like this question, but why are they here?” Brian asked. “You really do have an explanation for everything, don’t you?” He tightened his mouth in an angry grimace. Brian exhaled a tired sigh, and then drew me close to him. “I’m sorry. I didn’t intend...” He swallowed hard and tightened his embrace. I rested my cheek against his chest and breathed in the soapy lemon scent of his wool sweater. His embrace felt strange. Aside from the quick hug we shared at Greta and Jake’s wedding, it had been years since I’d felt Brian’s arms around me. Until we’d both heard about Greta’s illness, we’d spoken only when we had a specific reason and ended our calls after exchanging polite questions about each other’s wellbeing. Brian was about to respond when I spotted a woman walking toward us, and he followed my gaze down the hall. I knew she was Dr. Hunter, because Greta had described her black hair, worn in a distinctive braided twist sitting like a crown on the top of her head. Her palm felt comfortably warm and she held our handshake long enough to communicate concern. And as if I’d been holding my breath, I released all the air in my lungs and the stiff muscles in my neck relaxed. Brian folded his arms across his chest. “I’d like to talk with you about the protocol. I assume you’re recommend- ing a combination of drugs. Correct?” It sounded more like a challenge than a question. Dr. Hunter cut her eyes to me before focusing on Brian. “First, I’m going to talk with Greta and Jake,” she said, her voice kind but firm, “and after that, if it’s okay with Greta, I’ll be happy to answer your questions.” With that, she walked the few feet to the conference room and knocked softly before she entered. “I know, I know.” I didn’t need him to tell me what it was like to live in fear. It had left me clinging to ropes on a swing, riding up on my impatience over Brian’s bluster and bullying, then swinging back and feeling as sorry for him as I did for myself. With no words left, I turned away. Through the glass, I caught Sam and Ida watching us. Sam quickly shifted his gaze to the window, but Ida, her forehead still wrinkled in a frown, continued staring at me as I walked into the waiting room to join them. Despite its twists and turns, I found the footpath through the woods easy to follow. I shivered as I grabbed the collar of my jacket and pulled it tighter around my neck, all the while wishing for a thick scarf to protect me from the damp wind blowing off Lake Michigan. Marianne, the desk clerk at the Iverson Inn, had given me directions to Sam’s workshop, so I’d headed down a path behind the café and around the tennis courts before it veered off into the woods along the shore. 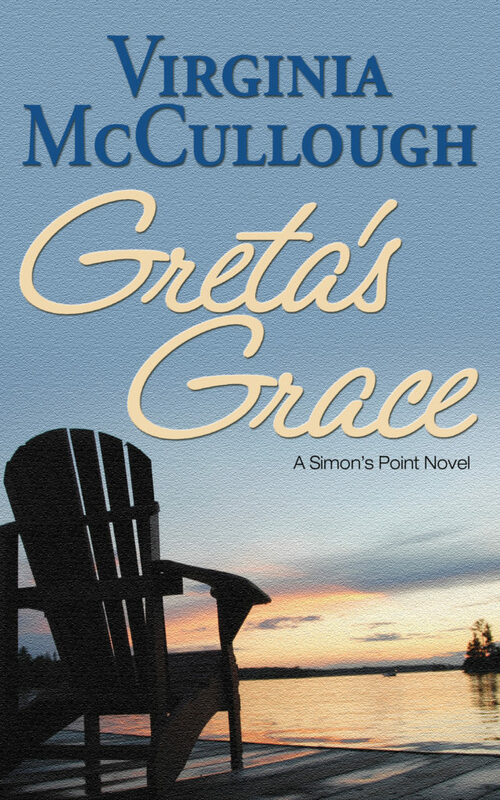 Rather than going back home to Chicago, I’d followed Greta and Jake to Simon’s Point and checked into a room at the inn that Sam and Jake owned together, along with their rental cottages and cabins. Before leaving Green Bay, I’d pulled Greta aside and told her my idea about moving to Simon’s Point during her months of treatment. At first she objected, but in a distracted sort of way, arguing that moving would disrupt my life. Her words sounded like a reflexive response, and a weak one at that. I’d also told Greta that I wanted my mother, her beloved Grandma Annie, to be comfortable during what I expected to be extended visits. A place we could really settle into appealed more than a room at the Iverson Inn, no matter how lovely. When I spoke with Jake about it, he assured me that his dad would be happy to show me one of their cottages. As I shoved my cold hands deeper into my coat pockets, I wondered again how I could be so poorly pre- pared for the biting cold of an Upper Midwest February. I’d endured raw Chicago winters all my life, after all. But the nature of my work as a professional speaker had led to the habit of dressing for short jaunts between airports or parking lots and hotel check-in desks. Walks in the woods weren’t part of my typical day. The faint sound of piano music filtering through the trees caught me by surprise. As I continued on the path the lilting melody became louder, and more unlikely yet, recog- nizable. I could match only a handful of classical pieces with their composers, but this Chopin waltz happened to be one of them. Greta had leapt and twirled to its rhythms in ballet class when she was perhaps seven, certainly no more than eight years old. The memory flowed through me in one heartbreaking piece. In my mind’s eye, I saw myself sitting with a dozen or so other mothers in a row of folding chairs, each of us fixing our gaze on our own miniature ballerina in the sea of black leotards and pink tights moving in a wave across the floor. I felt lightheaded as the image sharpened. Even in the woods, I could almost smell the damp and slightly sweaty scents that filled the air in that old dance studio. When the path took a sharp turn the workshop appeared, and the images from the dance studio vanished back into my memory. Through the open door I saw Sam bent over a piece of wood stretched across two sawhorses. I froze in place and watched as he tapped his fingers back and forth over it, as if playing the Chopin piece on a key- board. Sam’s long, narrow face with its high forehead and slightly receding hairline struck me as more pleasant than handsome, but he had the appealing lanky build of a long- distance runner. As I approached him, though, his dark blue eyes threatened to disarm me. They communicated such kindness that I had to focus on something else. I’d been trying so hard to stay strong, and knew I couldn’t han- dle looking into a face capable of revealing such empathy. Sam grabbed his gloves and led the way up another narrow path along a crescent-shaped cove, where the dull gray of Lake Michigan matched the color of the smoky bank of clouds hanging heavy in the afternoon sky. I tried to fall into rhythm with Sam’s sure steps and match the crunch and squeak of his boots as he left footprints ahead of me on the hard-packed snow. But my steps were awkward and kept me a frustrating half-beat behind. Since we were talking about Greta, I couldn’t be certain Sam was right. I didn’t expect him to understand my daughter’s ambivalence about our relationship. Sam’s mimicking tone amused me and coaxed a smile to my face. I hadn’t found much to smile about in the last couple of weeks. I understood why. Bare tree branches arched over the wide path leading to the water’s edge. Even on an overcast day, the beauty of the shore invited me to stay and make myself at home. A stiff-legged dog appeared rounding the corner. At one time, Joplin must have been a fine looking dog, but his coat had lost its luster and his face showed patches of gray. With obvious effort, he lifted one paw and rested it on the bottom stair. His eyes glassy, he stared at Sam and cocked his head. “Okay, Joplin, I’ll get you.” Sam went down the steps and with a soft grunt bent over to scoop up the dog. I pushed the door open with my hip and he carried Joplin inside. He gently put the dog down on the crocheted rug in front of the kitchen sink. “Well, he’s still a beauty,” I said, trying to be...well, charitable. All in all Joplin cut a depressing figure. I wasn’t sure how I felt about him looking so comfy in the place I planned to call home. A brief stab of guilt followed, but I’d never been much of a dog person. We stood at the long counter separating the kitchen from the larger living room. A brick fireplace with book- shelves on either side filled the far wall. The cushions on the couch and reading chair were a color that closely matched the outside cranberry trim. Sam went past me and into a small hallway and disappeared behind what I assumed was a door to one of the two bedrooms he had mentioned. Within seconds, the lights came on in the two main rooms. Small consolation. The stupid question hung in the air. I distracted myself by browsing through a row of paperback mysteries and romance novels, most likely left behind by vacationers. Other shelves held little porcelain figurines of fiddlers and dancers, and odd dishes and glasses, filled with pebbles and stones. “I’m glad.” The male voice came from behind. I pivoted around to see Jake standing in the kitchen. “So, you really are staying,” he said. I felt a rush of warmth toward Jake, but at the same time I hoped he wasn’t just being polite to the mother-in- law he didn’t know all that well yet. Sam soon joined Jake at the counter. While they took out pocket-sized notebooks and made a list of what needed to be done, I peeked into both bedrooms. One had twin beds with classic plaid spreads and matching curtains, a room perfect for my mother’s periodic visits. I chose the bedroom for myself that had a brass double bed and a yellow and white quilt, plus two large windows that overlooked the side yard where small pines poked through a patchy carpet of snow and wet leaves. I immediately felt like an idiot. The silly clap was bad enough, but where had those stiff, formal words come from? I sounded phony, but even worse, condescending, as if dutifully thanking a couple of strangers. But like the stupid question about the fireplace, I couldn’t inhale the words—or the tone—back into my mouth. Sam’s expression gave away nothing, but Jake’s raised eyebrows let me know that my patronizing attitude hadn’t gone unnoted. “The way I see it, Lindsey, the whole family is in this together, and Greta is all that matters.” Jake’s raised voice echoed in the cold room, and Sam frowned in his direction. “I agree, Jake.” Not wanting to meet their eyes, I turned away. What an odd collection of characters Greta had gathered around her. There was Jake, of course, a sturdy young man, the type who inspires great trust. She also had no-nonsense Ida, who clearly loved her, but perhaps tilted toward overly stern. Based on what I’d seen, Sam had great affection for Greta as well. Then she had my mother, her Grandma Annie, who would soon return from her latest foreign adventure. As always, Greta would lean on the first hero in her life, her dad. had no idea what she would want or need from me. Greta’s Grace is like a tapestry of love and support weaved together with raw yet powerful emotion. What a lovely story…McCullough’s storytelling is friendly and comforting, something that two friends would share over a cup of hot Apple Cider. I felt unrushed as characters came alive in my mind.